IRIS’ vision of great orchestral literature has always included a focus on American music and commissioned new works. Iconic IRIS, this program features American composers Aaron Copland and Samuel Barber. Also on the program, Stravinsky’s “Dumbarton Oaks” was named for the Washington D.C.-area estate of the couple who commissioned the concerto for their wedding anniversary. IRIS Orchestra gave American composer Adam Schoenberg his first orchestral commission with “Finding Rothko” in 2007. 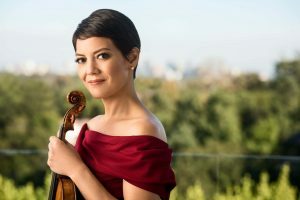 In this program, Schoenberg’s most recent concerto will be performed by Anne-Akiko Meyers, the virtuoso violinist for whom he wrote the piece. From IRIS’ perspective, this program is as varied and diverse as America itself.